Valid for Sunday-Wednesday nights, 2 night minimum stay required. Does not apply to stays that include Thursday-Saturday nights. *Breakfast and dinner are Chef's Choice. *Meals Included: Dinner on arrival day. 3 meals on full days. Breakfast on departure day. 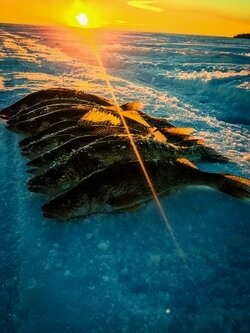 On the Minnesota side, our ice fishing take consists of walleye, saugers, northern pike, eel pout, jumbo perch and tullibee. We have 4, 5 & 6 man fish houses. Please note: Breakfast and dinner are Chef's Choice. Boxed lunch. On the Canadian side, our ice fishing take primarily consists of crappies. Once crappie limits are reached, we will target additional species. ​Recommended fishing tackle: Tungsten jigs, small jigheads. Electronics if you have them. Any plastic bait that mimics a blood worm. (No live bait in Canada.) We sell everything you need in our bait & tackle store! Includes transportation. Bait is extra. $425 - Up to four people. Includes guide, pop-up shelter (up to 4), heater and propane. Gas, bait and fillet extra. You provide your own snowmobile. $500 - Up to four people. Gas, bait and fillet extra. 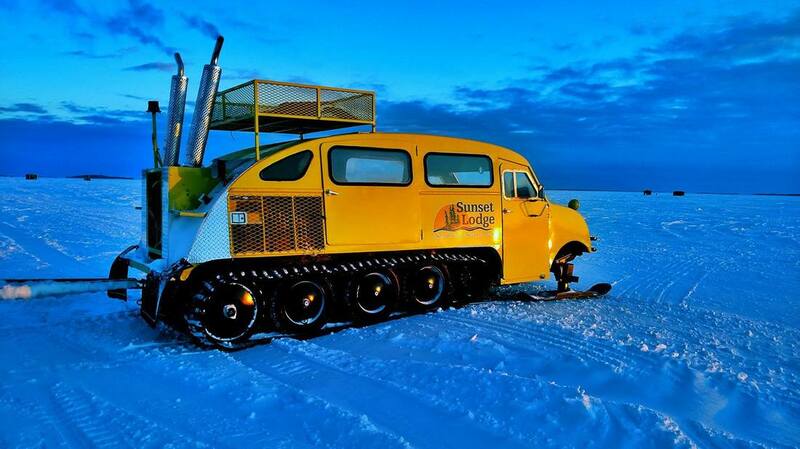 You provide your own snowmobile. Pricing is subject to local and state sales taxes. Gratuity is not included in these prices. Pricing is subject to change without notice. Sunset Lodge is now accepting pre-payments. You may pre-pay before arriving or at check-in. We would prefer one payment for groups over 4. Deposit & Cancellation Policy: Deposits are $100 per person and are non-refundable if not cancelled within 30 days of stay. If less than 30 days, we will keep deposit on file to be used toward a stay within one year. Early Checkout Policy: For early checkout, you are responsible for the entire reservation and will be charged as such. If we are able to re-book your unused days, we will mail you a refund for those days. Peak Dates: January, June & July. Limited availability may require a 3 person minimum in 4 person cabins/condos. We recommend booking a guide in advance to ensure there is one available during your trip. You may cancel your guide 30 days prior to your arrival date. If less than 30 days, you will be charged a $100 cancellation fee. Check in 2:00pm and check out is 10:00am.